We all have those students that raise their hand and say, “I’m done, now what do I do?” We also have those who finish with their work and decide its time to play and distract others. Does this sound familiar? I want my students to be engaged with something meaningful at all times. I believe in the power of choice when it comes to choosing what to do when all work is complete. This is where the choice board comes in. A choice board is a tool that ensures students incorporate a range of multiple intelligences, and/or learning preferences. This is an example of a choice board that I have displayed in my class. I have made it so that I can change out activities as needed. Each subject is color coded so that students can easily locate what they want to complete. For every 9 weeks, I provide my students with a total of 72 activities that address Reading, Writing, Words, Math, Science, and Social Studies. There are 2 activities per subject/per week. I color code each subject for students to easily distinguish between subjects. I allow my students to chose the way in which they compile their activity. They are provided 8 project ideas to choose from. All eight intelligences are addressed with these projects. 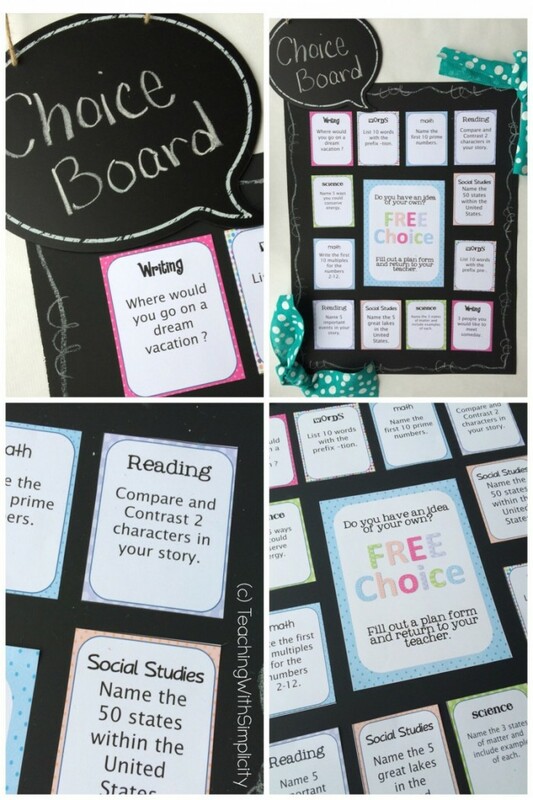 Because the purpose of The Choice Board is choice, they also have the opportunity to choose their own topic and/or project to complete with approval. We call this free choice. I choose not to grade the projects, but that is your choice. I choose not to grade them as they are used as sponge activities. 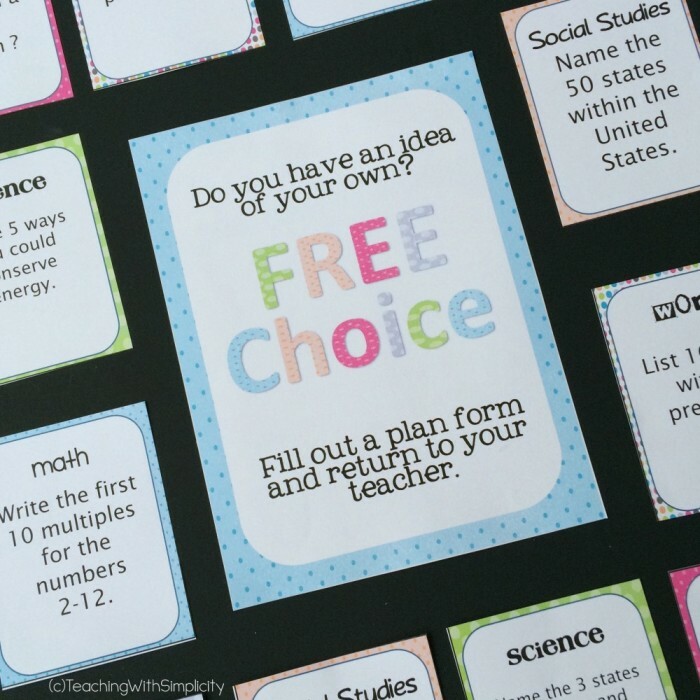 The Choice Board provides my students with a learning experience without an attached grade. Students are excited to work on them and are proud of their finished product. I have a 36 week collection of Choice Board activities. You can find it HERE.